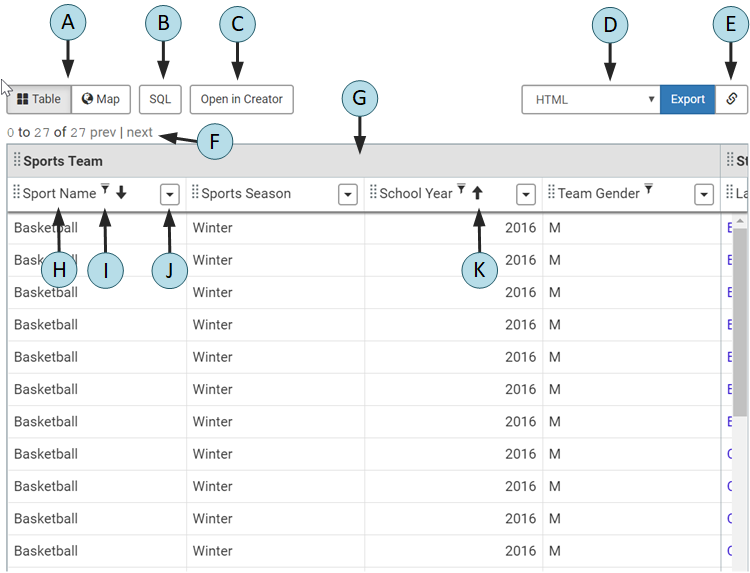 Learn about the various components of the Pull Reports™ Canned Query Viewer client. The Canned Query Viewer displays controls to interact with one <canned_query> to create an export result. The Canned Query Viewer is only applicable to <report> configurations which contain at least one <canned_query>. The header displays the current <canned_query> name and the full screen button. The "All Reports" breadcrumb links to the Report Repository. Toggles the creator between normal and full screen mode. Press the Full Screen button again or the Escape key to exit full screen mode. The Filters panel supports editing of filter parameters to be applied to the Export Report REST API export. The filter configuration is preset by the <canned_query> configuration, but the filter operator and value(s) may be adjusted to customize the export result. The Filters panel indicator reflects the number of filters applied to the Export Report REST API export as a superscript to the Filters label. 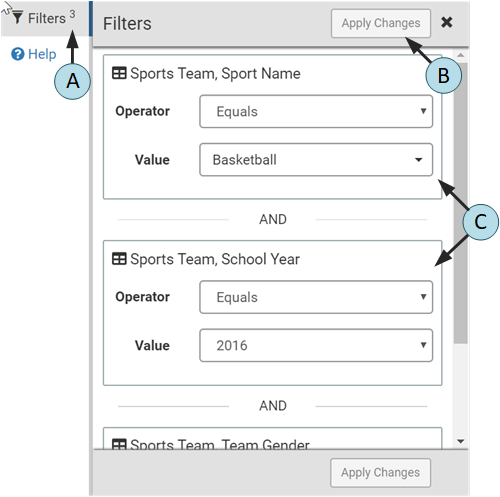 The Apply Changes button becomes active when a user changes a filter's operator or value. Click the button to apply the filter changes to the export result. Each filter configured by the <canned_query> is listed with appropriate operator and value controls. The Results Preview displays a limited preview of the export results and contains controls to export the report to any export format. Toggles the Results Preview between table and map view. The View mode buttons are only available if the <report> may be exported to the geojson format. The default view mode may be set via the viewMode <canned_query> attribute. Displays the Structured Query Language (SQL) and query parameters to be used when creating the export result. The SQL button is visible when the export.sql.active configuration property is true for the report and the current user is permitted to request the GET Export SQL endpoint. Clicking the Open in Creator button opens the current export report configuration in the Ad Hoc Report Creator so as to further parameterize the export report. Use the browser's back button to return to the Canned Query Viewer. The export format select list displays the available export format parameter values. The Export button exports the full report to a new browser window in the chosen format. The Export button turns red and becomes disabled if the total number of results exceeds the configured export.report.maxResults. The export URL dialog button button reveals the Export Report REST API URL and HTTP parameters to be used when the Export button is clicked. The pagination indicator and controls display the current page of export results with links to navigate to the previous and next page. The page size is 100 records. The total number of results displays red if it exceeds the configured export.report.maxResults. Table cell headers are above adjacent columns within the same table. Re-position all columns under the header by dragging the table cell header to the left or right. Click the remove button to remove all columns under the header from the export results. Column cell headers are above each column. Re-position a column by dragging the column cell header to the left or right. Column cell headers display a filter icon if the column is used within a filter. Click the Column cell header remove button to remove the column from the export results. 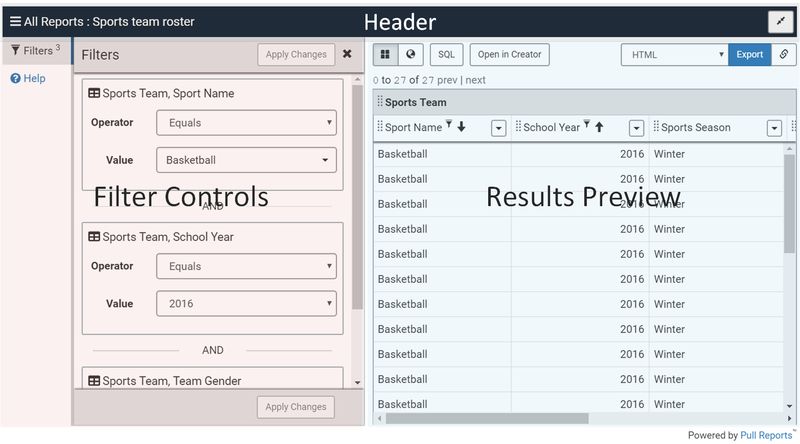 Click the Column cell header menu button to display additional controls for column sorting, filtering, and positioning. Column cell headers display an ascending or descending indicator if the respective sort is applied to the column.